Surgery to remove cataracts is one of the most frequently performed procedures today. It is also one of the most successful and safest procedures in medicine today. It is estimated that there are over 14 million lens implant procedures performed each year. In your parent’s or grandparent’s days, cataract surgery was usually delayed for as long as possible because it was considered risky and required several days in the hospital. Today, cataract surgery is performed on an outpatient basis and the procedure itself only takes a few minutes. The risks are much lower and the recovery is much faster for most patients. Today, patients have their surgeries done earlier. There is no need to wait until the cataracts are “ripe”. Cataract surgery is elective surgery and that is good news for the patient. There is no need to wait until your vision is very poor. We advise our patients to consider cataract surgery when the cataract begins to affect their life styles; close vision, driving, sports, reading or otherwise. The cataract will typically not damage your eye while it is growing, so there is also no need to rush into the surgery. You can decide when the time is right for you! Dr. Stephen Slade and Dr. Bennett Walton perform the procedure within our office based operating suite or at our local surgery center, just a few blocks away from our offices. You will arrive about an hour before your actual surgery. You will be given a mild sedative to help you relax. The area around your eye will be cleansed and a sterile drape will be applied around your eye. The surgery only takes a few minutes but plan to spend 2 to 3 hours at the center for the preoperation procedures and recovery. Dr. Slade and Dr. Walton will use a powerful anesthetic eye drop to completely numb the eye. Using only a topical anesthetic avoids the risks and pain associate with needle injections and provides a much quicker return of vision. There is no need for shots or injections. A small instrument will be placed between your eyelids to keep you from blinking. 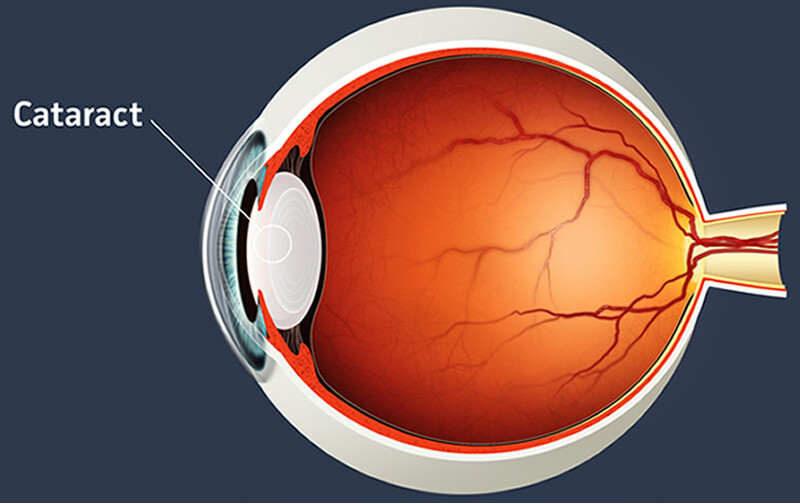 In Laser Cataract Surgery, the laser is used to make the opening in the eye, an opening in the lens itself and to treat the lens. If needed, an ultrasonic instrument will then gently break the cataract into microscopic particles, which are then suctioned away. Next, the Intra Ocular Lens (IOL) you chose to correct your vision will be inserted into the same location that your natural lens occupied. Once the IOL is locked into position, the micro-incision seals itself, typically without the need for sutures. It remains tightly closed by the outward pressure within the eye and provides a fast and much more comfortable recovery. You will be released soon after the procedure to go home and relax for the rest of the day. Your eye will not be patched and most patients are able to see well after surgery. Visual recovery varies from patient to patient but most patients return to their normal activities within a day or two. If you have cataracts in both eyes, the second procedure will usually be scheduled within a week or two. Serious complications are extremely rare, but it is surgery and there are some risks involved. One of our counselors will provide you with additional information about the risks associated with cataract surgery. Choosing an experienced surgeon for your procedure can significantly minimize the risks involved with your cataract procedure. Please watch the video below to learn more about the procedure. If you have questions about Cataract Surgery, please do not ever hesitate to call our office at 713-626-5544 and speak to our experts.